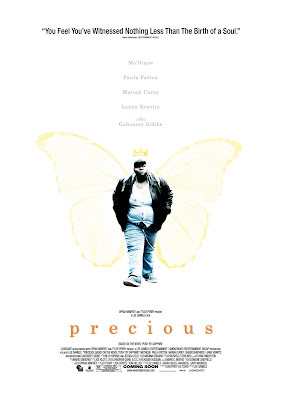 Since Precious: Based on the Novel 'Push' by Sapphire was released, I had wanted to see it. I guess it was because reviewers kept saying it was pretty depressing, and strangely, I quite like depressing movies. But on the depress-o-meter, this movie falls behind the likes of Once were Warriors and Revolutionary Road. Keeping in mind that I have not yet seen Requiem for a Dream. In Harlem, 1987, a sixteen year old girl Precious (Gabourey Sidibe) who is pregnant with her second child by her father, is abused by her mother (Mo'Nique). She just wants to learn how to read, but has been kicked out of her school because of her pregnancy. So she goes to an alternative school, where she meets a caring teacher Ms. Rain (Paula Patton) who wants to make a change in her life, for better or for worse. Despite it's evident emotional inconsistency, this movie's spirit comes from the amazing performances from Gabourey Sidibe, Mo'Nique (who fully deserved the Oscar; if she hadn't got it then that would have been one of the worst mistakes in history), Paula Patton and a surprise Mariah Carey, who I think looks better without make-up and glittery outfits. As many people have said, even the toughest cynics will be touched by this story. And I am sure, everyone who watches this will cry at some point, or feel pretty sad for these characters. Aside from the emotional inconsistency, the direction is a little crazy in the beginning...it's like the cameraman is trying to figure out how to zoom and move around the camera, which is unnecessary to the particular shot. Overall, this movie is fantastic and a true Oscar-winning film, though it's unfortunate this film couldn't get more awards in the year of The Hurt Locker, Avatar and other critically acclaimed nominees. Great performances from a talented cast, a compelling drama. First of all, love the site design. I look forward to following and reading. As for Precious, I thought it was powerful for sure, but it left me colder than I had wanted. It felt, to me, like a slice of a larger story that doesn't complete itself. Nice write up though. I have to agree with you there, I did feel that it was a little uncomplete.